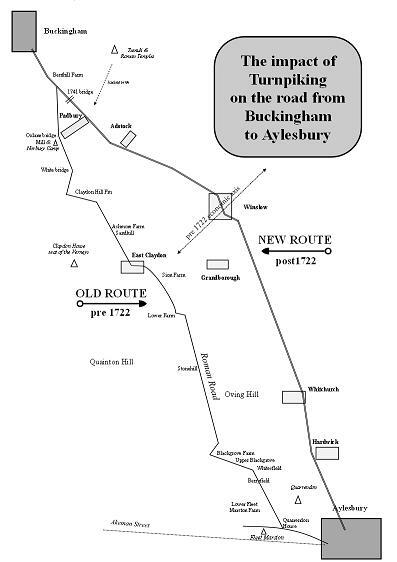 How many of us realise that Buckingham’s "main" road to Aylesbury via Winslow and Whitchurch is comparatively recent, being a brand-new route for a turnpike, created around 1722? For hundreds of years, travellers to Aylesbury and London, including those on the Buckingham "Old" Stagecoach, took an entirely different route that included parts dating back to Roman times, or earlier. Both routes are roughly the same length, so why was the route changed so dramatically? The old route was more evenly contoured and tended to be at river and marsh level. Of course, more uneven surfaces combined with less-advanced wheel and axle technology meant that the older route avoided too much strain on wagon and beast: “Gently does it”. The price to pay was two-fold: that route missed out many important settlements and in times of rain and flood it became nigh impossible. Buckingham was effectively cut off from London during a typical winter. The original route evolved, it was not the dream of a planner and his team. The army still does it that way . When it moves to a new camp, paths develop informally; those that are well used and show worn grass are subsequently asphalted. Those firm surfaces channel use and alternative routes fade away. The new route is characterised by steeper gradients, by running along the ridges of hills, by being better prepared, surfaced & drained and by serving and invigorating more places along the way. Speculative investors were pouring money into roads, and, such men wanted highways nearer to where they lived, as well. In a way, turnpikes were akin to today’s 3G mobile phone licence auctions: hot money poured in, but few got rich as a result. There’s plenty of evidence that the old road was used as late as 1756. There were four reasons, perhaps: tradition, toll-free status, out-of-date maps and, moreover, a vital piece of infrastructure was missing from the new route for decades. That was a bridge over Padbury Brook: it wasn’t completed until 1741. The first itinerary to annotate the “new route” seems to have been published by Thomas Jefferys in 1775. In those terms, it will be another 25 years before the AA recommends the Buckingham by-pass to those travelling from Oxford to Cambridge via Buckingham! In time, the poor old road literally faded from view. Parts survive as tracks and bridle ways, but infrastructure has decayed so today even a farmer on his quad bike would be hard-pressed to go to Aylesbury by the traditional, well-trodden track. Genesis of the old way: "In the beginning was the Word"
Yes, the beginning was probably the Word of God, or Words of Gods. North Bucks possessed important religious shrines, some pre-Roman, but Romans were good at pouring new wine into old gods. Roman "military" roads were planned and, therefore, straight. But the roads to gods, even Rome’s adopted gods, were windy, informally laid down by the passage of pilgrims. 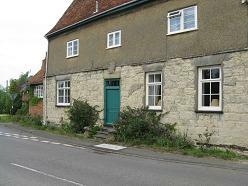 Part of our route dates from Roman times and helped to connect an important religious site near to Thornborough bridge and the Thornborough tumuli with Fleet Marston – not only the spot where John Wesley preached his first sermon in 1725, but an important village and religious site when legions were afoot. What is certain and not surprising is that in many places, the old road is coincident with parish boundaries; thus it defines Hogshaw and Quainton to its west and Granborough, North Marston and Oving to its east. On the line of the old route were villages that declined in importance, or were deliberately depopulated. Quarrendon is an example; now the name of a secondary school; once it was a thriving mediaeval church and village that gave way to an extravagant Elizabethan manor garden. Was it not at Quarrendon that Aylesbury’s "Rumbold" , aka St Osyth, lived? Let’s take the former route a stretch at a time from the Buckingham end. Leave Buckingham by the Sheriff’s bridge (roughly the Old Ford) and, possibly, proceed by today’s route along London Road to Bent Hill just beyond Tesco where old and new separate. Two other routes seem to have been used: either along Bourton Road and then turn right , or the ancient route from Prebend End, across a causeway and left past the Cross Keys Inn along Lenborough Lane. The old route was more westerly and headed in the direction of the "Ox Lane" bridge west of Padbury. It passed through lower Padbury, past its mill and all that remains of the ancient Norbury Camp (flattened during WWII) , then the road carries onwards towards White Bridge, Ashmore Farm and Sandhill. We’re off to East Claydon and the first coach-stop on the route to London at The Swan. This house is at the centre of the village and is fashioned from stone. When the Winslow turnpike was constructed this property was owned by the Abell family. East Claydon was economically important, and a carrier plied trade around its hinterland. Property values collapsed with the post-1722 side-lining of the village. Property sharks moved in, and it was around this time that the Verney Family of Claydon House consolidated their assets. They had become experts in the identification of brides with dowries and land with potential. Thus, these days the former "Swan" Inn sports the Verney arms over its door. To be fair, the Verney family became a great and liberal benefactor towards "the Claydons". One of them had identified East Claydon as a "poor town" in 1740. By the 1820s even the church recognised the decline of the Claydons when it made the area into a single benefice. 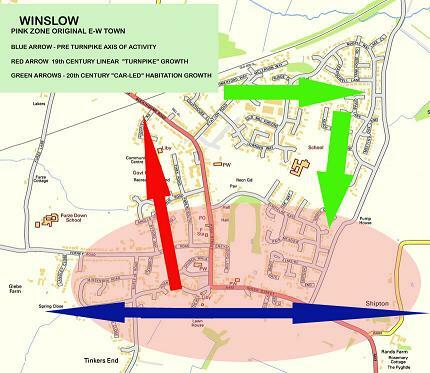 Within 100 years, Winslow’s population probably doubled and its main "economic" road changed from Horn Street, that connected the town with the Claydons and Granborough, to the High Street that runs to Buckingham. We avoid the road to Botolph Claydon, our route is east of that village as we move along what is now a mere footpath past the track to Sion Farm and towards a 2 km straight section that declares "I’m proud of my Roman origins". It passes Stone Hill Farm running onwards towards Blackgrove Farm. There is Quainton Hill to the right and Oving Hill on the left – so, as is usual for this ergonomically sound route, it is avoiding the worst gradients. Blackgrove Farm is at a junction. Straight ahead lies a track to Waddesdon. Our route turns sharply left to Upper Blackgrove and onto Whitesfield where it bends a little to the right to pass Lower Fleetmarston Farm (on the right) and onwards a mile through the Berryfield district of outer Quarrendon (known for its crops of beans) until at Quarrendon House (with the remains of the ancient Quarrendon church behind it) we turn left onto the A41 from Waddesdon that completes our old route into Aylesbury or Ailesbury. Originally, this route would have been along the pre-Roman "Akeman Street" that lies buried alongside today’s busy road.